(1) With grant monies having been received, one of the main purposes of this trip was the Gloria Dei building project. (2) Carry out discussions regarding accountability for the Gloria Dei Building Project and the Lutheran Farm project. (3) General check on progress. (4) Take pictures for Adopt-A-Student program. Lil, Laraye, and Talis flew from South Dakota to Haiti. Talis, an electrician, spent time patching up and repairing existing electrical work. Since the land at the Gloria Dei building sight had been reclaimed from the ocean, it has a very high water level and requires a special (more expensive) cement pad foundation so that whatever is built on it will not sink. The land had not been prepared prior to our group's arrival (the cement pad foundation had not yet been laid,) and so they were not able to do any building. They did speak with the contractor and received a favorable impression that he would do a good job. Pictures were taken of the students at the Gloria Dei school for this year's Adopt-A-Student program sponsors. As the bridge from Cap-Haitien to St. Raphael had been washed out, our group was unable to visit. As part of the discussions about accountability, Pastor Bernard agreed to forward for distribution letters from various recipients who have received aid. There was some discussion of the amounts of the pastors' salaries with respect to their living expenses. Our group repaired, painted, and cemented in some of the playground equipment at the Madeline location. One day, the nearly 500 students at that school came out into the courtyard and sang for our group the Haitian national anthem, "How Great Thou Art", and another song - in French. Had the opportunity to visit with members of the Nebraska group (Pastor Nowak, Jack Hunter) in Haiti for a few days. The members of the Nebraska group took our group out to dinner. Visited the chicken farm with its 1200-1500 chickens. (Chicks are sold every 6 weeks.) The farm suggested that profits could been improved if they were able to acquire a grinder (which would cost approximately $3,000.) Of the five buildings on the farm, only three are being used. Another 1500 chickens could be added, but the costs of the additional birds and feed would run about $5,000. Visited the orphanage in Ouanaminthe, Haiti. Impressed at the trees, plants, etc. for food. Regarding the Madeline Clinic, a doctor is working there two days each week. Lil did some repair work on the clinic's bathroom sink. 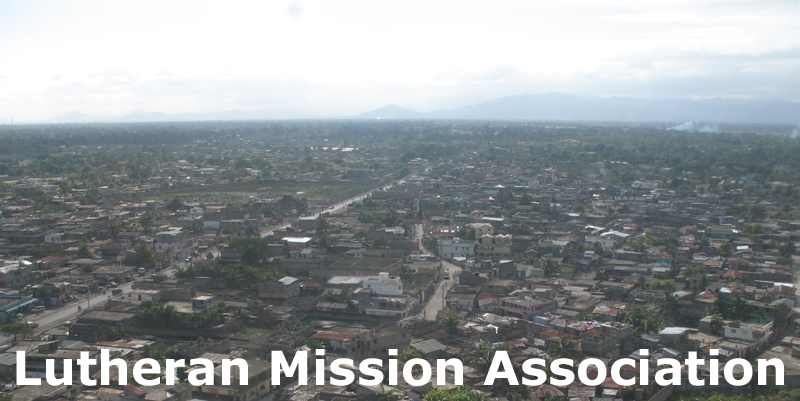 Lutheran Mission Association is a 501(c)3 non-profit organization. Donations may be made online through PayPal, or checks (made payable to Lutheran Mission Association) may be sent to: Mrs. Lil Spilde, Treasurer; 24815 463rd Ave; Colton, SD 57018. Support us by spreading the news about LMA. Like us on Facebook. Email: webservant@lmamnn.org. Contents of this website are copyright 2010-2015 Lutheran Mission Association or are used by permission as noted.